The more convenient the purchasing process is, the more orders customers are encouraged to place. 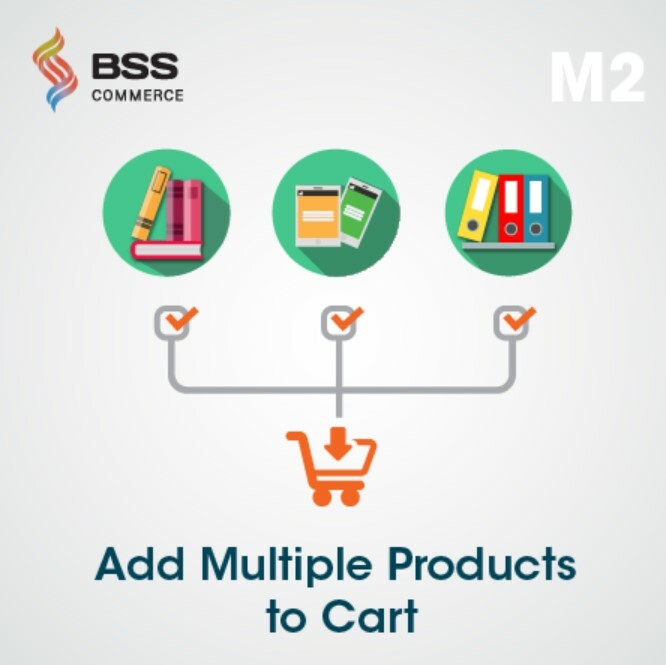 Hence, Add Multiple Products to Cart for Magento 2 extension is a great choice to drive sales and increase bulk orders by allowing customers to add various items to cart at one time without reloading separate pages. Customers, wholesale buyers, for example, can select any product in any amount via the checkbox and quality box, make use of ajax popup to select product custom options, as well as keep track of the mini cart in success popup. 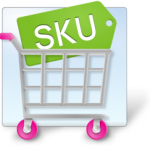 1.1 Does The Default Support Magento 2 Add Multiple Products to Cart Features? 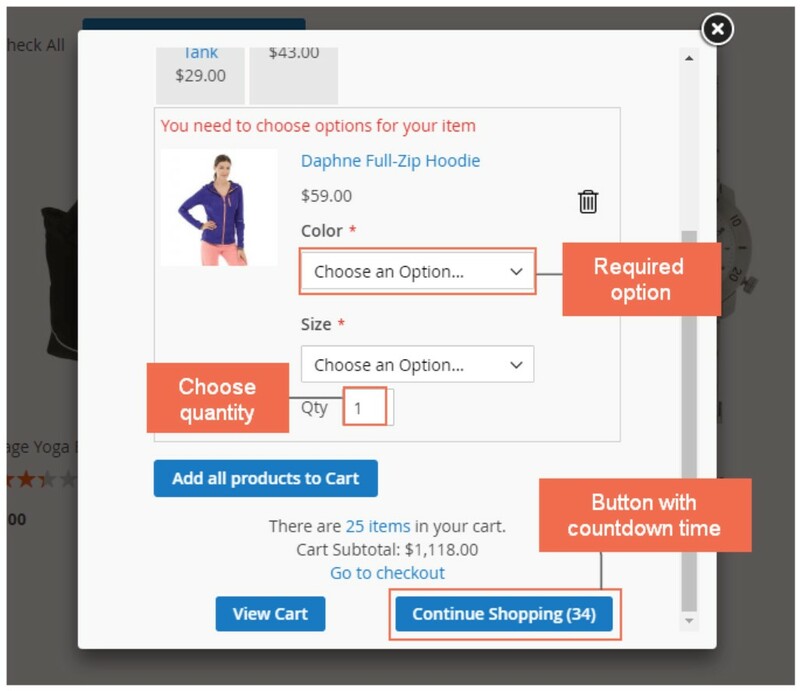 1.3 How Can Magento 2 Add Multiple Products to Cart Extension Benefit you? 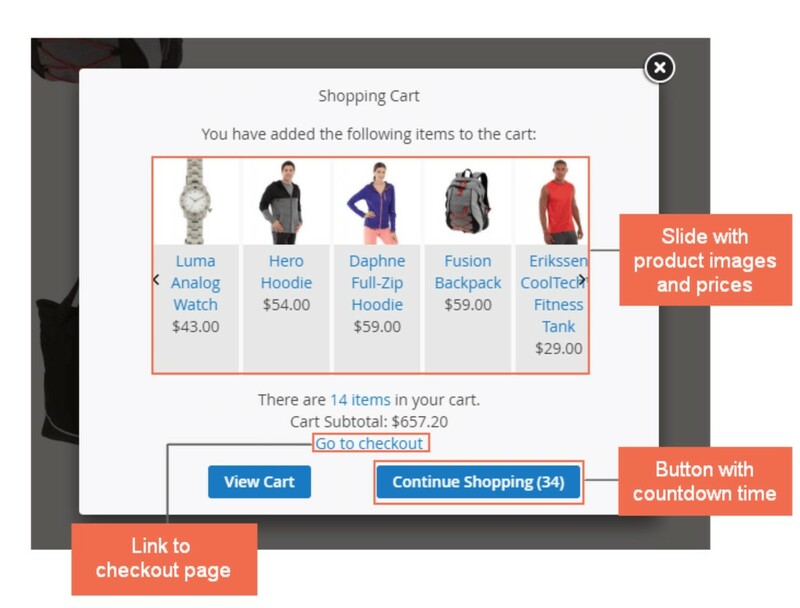 Add Multiple Products to Cart for Magento 2 extension improves customers’ purchasing experience better than ever. This Magento 2 extension works well with different product types including simple, bundle, configurable products, and simple products with custom options. On any page set by admins, customers can add all displayed items with a single click on check all icon, add all products button, or separately select multiple quantities and custom options as needed using the checkbox, quantity box, ajax popup. 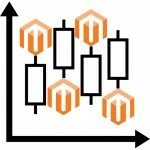 Does The Default Support Magento 2 Add Multiple Products to Cart Features? On the Homepage, Category Page, or Search Result Page, Grid View of Magento 2 default, customers cannot add multiple products to shopping cart. Instead, they are only able to include one by one item to cart. Moreover, selecting more quantities or custom options (for simple or bundle items) means customers’ going inside the product page. This process is time-consuming and inconvenient, particularly for bulk orders, it takes forever. As a result, customers feel discouraged from further shopping. With Magento 2 Add Multiple Products to Cart extension, supported by handy features, those problems are no need to be worried about. 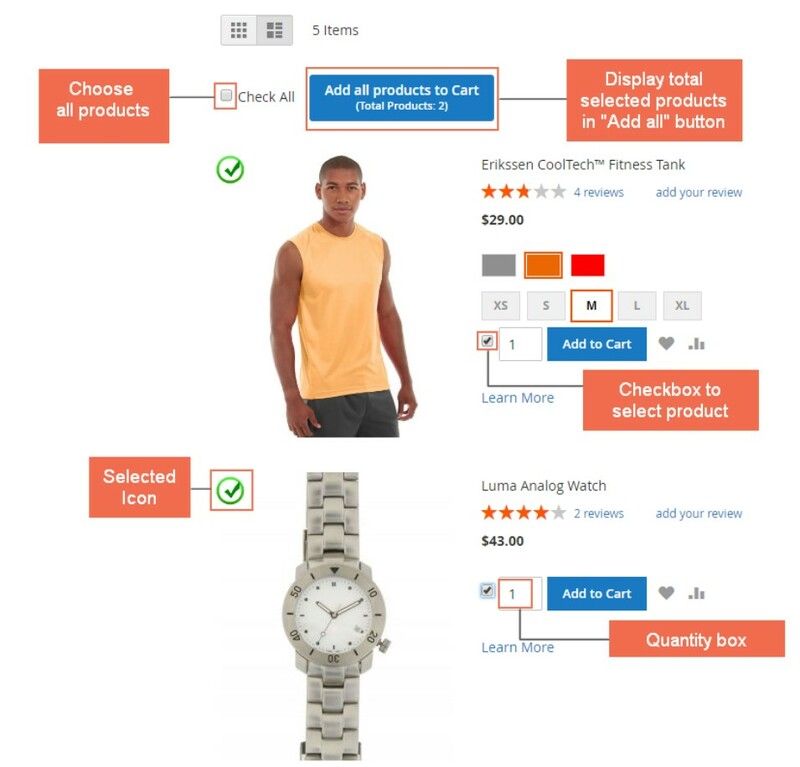 How Can Magento 2 Add Multiple Products to Cart Extension Benefit you? For admin, Magento 2 Add Multiple Products to Cart extension is an easy-to-use module. Within some simple configurations in the backend, e-commerce websites become more user-friendly which get customers relief from single product adding. Every customer, especially B2B or wholesale customers who involve large volume order at one time, wishes to get favourite items at their fingertips. Thus, Add Multiple Products to Cart for Magento 2 extension is a great choice to save users time and effort shopping online to shop more at one time, as well as enhance customers’ loyalty. Let’s explore how to get Magento 2 Add Multiple Products to Cart extension worked on your wholesaler sites within easy configuration from the backend. We will start configurations by going to Store ⇒ Configuration ⇒ BSSCOMMERCE ⇒ Ajax Add Multiple Products Cart. Please select Yes to enable this boost-sales module. 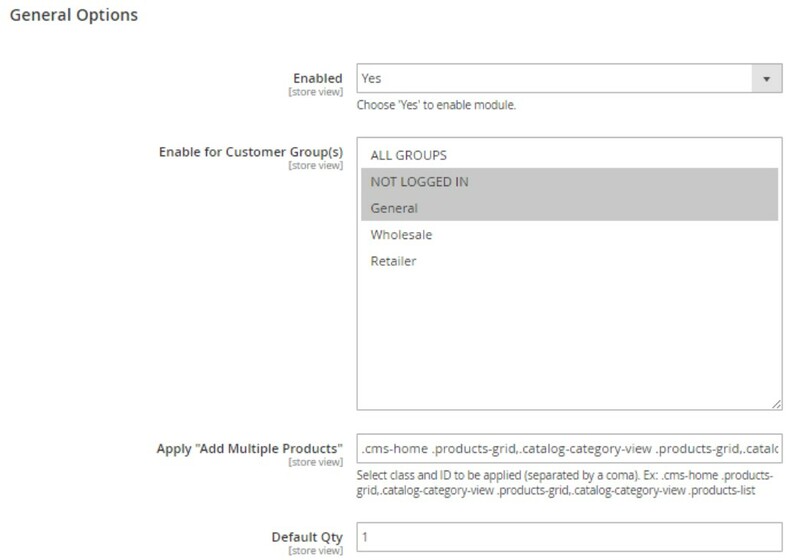 In General Options tab, admins can choose target customer group to apply “Add Multiple Products to Cart” functions as well as select ID and class to enable the module on any pages to make it more convenient for users to shop items. Note to separate applied classes from each other with a comma. Normally, the default quality is set at “1”. In case, the wholesale customers often place a higher volume order at one time, admins can fill in another number. 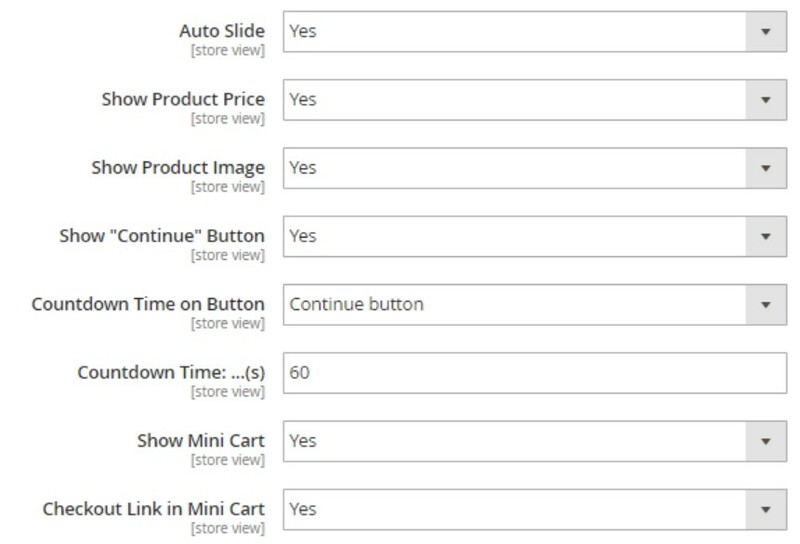 For the quicker add-to-cart process, Add Multiple Products Cart for Magento 2 extension supports various icons and buttons such as the checkbox, qty box, selected icon and “Add to cart”/”Add all products” button, each of which can be easily configured whether to be displayed, where to display,… For example, admins can choose “Add all products” button to be placed at Top, Bottom, Both (Top and Bottom) or Right (Scroll). To free customers from visiting the product page to get custom options for the bundle, configurable or simple products with custom option, Magento 2 Add Multiple Product include outstanding features of Ajax Add to Cart by which customers can select item options on ajax popup without leaving for other pages. Add-to-cart result is shown in the success popup. 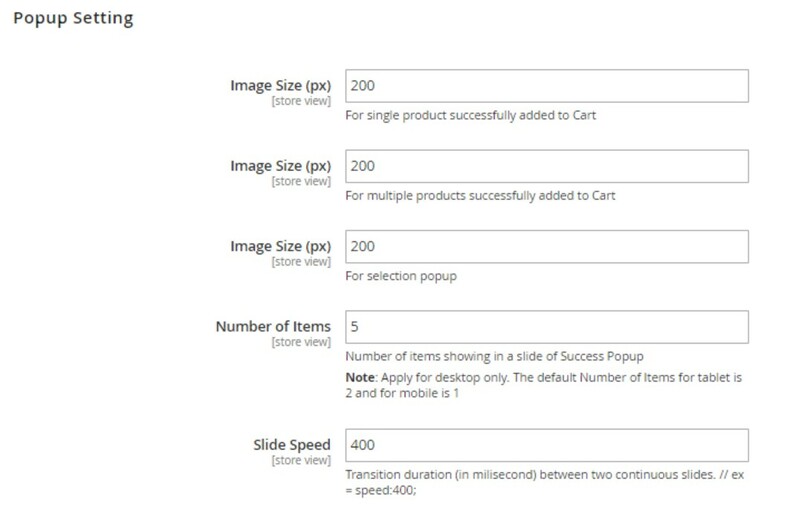 In Popup Setting tab, admins can choose product image size, the number of items, transaction speed between two continuous slides in the millisecond. Customers are likely to check mini cart very often. However, the notification of successful adding to cart is small on the top of product page which leads customers to scroll up times and times. So just customise the success popup with detailed information to make it easier for customers. In Popup Design, text and colour of buttons displayed on the popup are freely set in advance. Magento 2 Add Multiple Products to Cart extension’s configurations are very easy to follow, aren’t they? Let’s try it yourself, and your websites will become more customer-friendly. Here you see, checkbox, qty box, add to cart button are placed right at the customers’ fingertips. 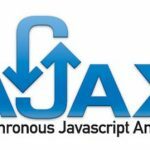 In case, customers need to select custom options, instead of visiting the specific product page, they can use an ajax popup configured in the backend. 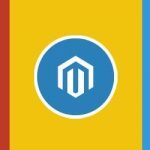 As mentioned above, mini cart in the Magento 2 default is hard to follow, we come up with Add Multiple Products to Cart success popup which included product details, check out links, as well as other buttons edited in the backend configuration, for encourage customers to perform next actions.